Help Kids at Lake Chabot Shoreline! 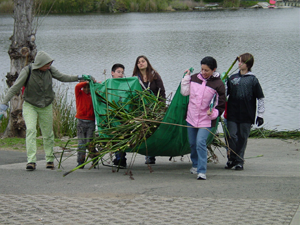 Kids are coming to Lake Chabot soon for the Youth Fishing Derby, and we need your help with a little shoreline improvement so they can reach the water. Wear sturdy clothes and shoes (waders if you have them), hat, sunscreen, and gloves. We’ll provide water and refreshments, as well as any tools that are needed. Enter the park at the east end of North Camino Alto, off Tuolumne past the Sutter Solano Medical Center. Please RSVP by emailing info@VallejoWatershedAlliance.org or calling (707) 644-8949 ext. 292.